Enlightens and protects the skin. 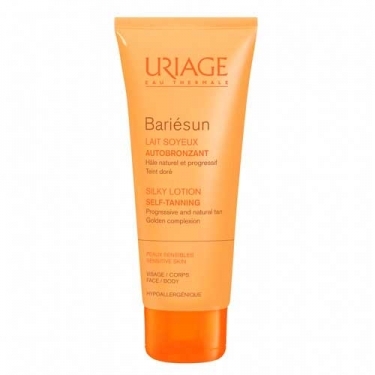 DESCRIPTION: Bariésun Lait Soyeux Autobronzant from Uriage is a self tanning milk that provides a natural tan, gradual and uniform. Formulated with Uriage Thermal Water, self-tanner complex (DHA + L-Erythrulose), uniform application of polymer and perfume, enhances and standardizes the tan gradually from the start at the same time protecting the natural protective barrier of the skin and moisturizes deeply. Hypoallergenic and non-comedogenic. Apply on face and body evenly. Remove the excess on eyebrows and scalp, not forgetting the feet, and the inside of the knees, elbows and wrists. Avoid direct eye contact. Wash hands after application. Reapply until the desired tone. It is recommended to exfoliate the face and body before application.